If you've been playing along with us at home, you know that we have a thing for a well made and thoughtfully designed bag. And while there are plenty of bags that sport things from solar panels, laptop sleeves, headphone conduits, etc...there is something satisfying in a bag that features some more simple utilities, and that is built to last. 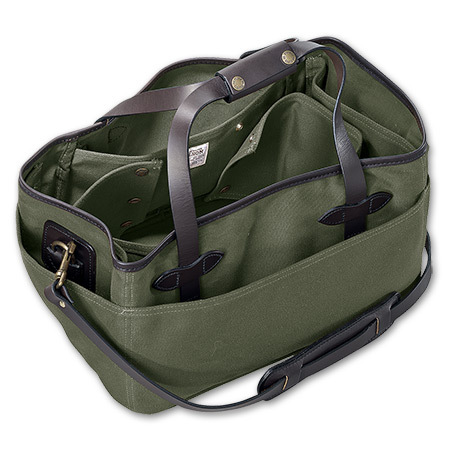 The Filson bag above fits that bill perfectly. It's one bag that truly covers multi-purpose, being a field bag, a travel bag, and a casual bag all in one simple package. It features two snap-out panels that allow the user to divide the space as he/she sees fit, essentially splitting the bag in half, or into thirds if you're into that whole three-way thing. And being a Filson product, it is designed to wear well, and is water repellant. You can see and learn more here.